We heard you like Tetris, so we got you some Tetris to go with your Tetris. If you have never played Tetris before, here's how it goes: You control a block falling from the top of the play area. You can move it left or right or rotate it, but when it lands, it stays put, and then you get a new block. If you get blocks horizontally all the way across a single line on the play field, that line disappears, and the blocks above it drop into the newly emptied space. The object is to make as many of these lines as possible, because if your stack of blocks gets all the way to the top, you lose. Tetris came out in 1985, and took the world by storm, starting a trend of block-dropping games that has never really gone away, although they aren't nearly as popular as they once were. Columns, Puyo Puyo, Bust-A-Move, Battle Balls, Klax, Magical Drop, Dr. Mario, etc. Most puzzle games nowadays are of the "match 3" variety. But I digress. 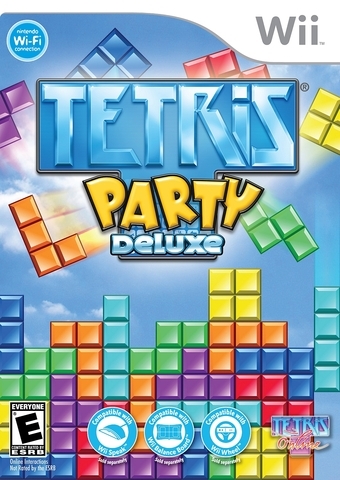 Tetris has had many releases across many systems over the years, and Tetris Party Deluxe is another solid addition to the pedigree. With ten different single player modes and nine different multiplayer modes (technically eleven, but two are just repeats with automatic handicap adjustment), there's a lot to like about the game. First things first, if you just want to play vanilla Tetris, the game has wisely made that an option from the main menu by selecting "Play Tetris!" If you are feeling a bit more adventurous, you can try out some of the game's other modes. I'm not going to go over every mode, but I will mention a few of my favorites. Field Climber adds a little stick man to the play area, and he will climb up your blocks as you drop them. The object of this mode is to get your climber to grab every flag scattered throughout the play area, then to the top of the screen. Be careful not to squish him or miss any flags, or it won't end well for you. Shadow mode has a gray silhouette of blocks in the background, and you need to drop your blocks to fill the entire silhouette, with as few blocks outside the silhouette as possible. You can skip a limited number of blocks per stage. There are 50 levels, and it is kind of neat to put the pictures together this way. If you ever accidentally complete a line though, it can throw everything off, which is kind of frustrating. Stage Racer has you dropping just one block through an obstacle course, where you will have to rotate and move it to get through gaps and to the end. These courses are ok in single player, but really light up in multiplayer, as you're not just racing the clock anymore, but other players. Duel Spaces is a two player game where each player takes turns dropping blocks into a very wide play area. If you drop your block so that it completely cuts off some empty spaces from ever being filled, you claim those empty spaces as your own. First player to get a combined total of 150 block spaces and empty spaces wins the match. This one is really interesting and strategic, because you can see the next six blocks each player will receive. This can give you room to set up a big play if you see your next straight piece is coming before your opponent's. One mode that kind of falls flat is Wii Balance Board Tetris. It's cool that Hudson wanted to add an extra mode for the Balance Board, but unfortunately it's just not very good. The control is as awkward and slow as you would expect from a tacked on Balance Board mode. Lean left or right to move the block left or right, forward or back to drop the block, and a quick squat to rotate. The blocks are huge (basically the Duplo to original Tetris' Lego) to help accommodate the difficult controls, but it really doesn't work well. Also, it's only single player, obviously, since you can only use one Balance Board. If you like the Duplo-sized Tetris blocks, but want to use a controller that doesn't make you shake that thang, you can also play Beginner's Tetris from the main menu. Other than Wii Balance Board Tetris, the rest of the games use the Wii Remote in the sideways NES position, which works perfectly well for this game. There is also Wii Wheel compatibility, but why you would ever do that when the game works so well with the default NES position is beyond me. As far as presentation goes, the game is quite colorful, but it really lacks personality. Tetris DS set a high standard with its Metroid, Zelda, Balloon Fight, etc. themed modes. Tetris Party Deluxe never really comes alive in the same way. In terms of music, there's the standard Tetris theme Korobeiniki, of course, and it sounds fine. There's also the lesser known by name but equally recognizable Kalinka and Katiusha, although their renditions in this game sound like bad synth remixes you'd download from OC Remix and delete them after one play. There are also a dozen or so other mostly generic music tracks. In terms of visual charm, there's stick figure guy, and that's about it. Oh, and Bomberman makes a cameo as one of the Shadow stage puzzles. There are several animated background images you can choose from, and some of them are kind of fun. But really they are just window dressing and don't feel particularly integrated into the game. The animations are preset and run on their own. It would have been a nice touch to have the animations affected by your performance in the game. There is a background with some penguins that waddle and slide by, though, so I'll not complain too much about it. There's also Mii support, but it's so bare bones there may as well not be. Basically, you pick a Mii for your profile, and the Mii's face pops up above your play area to let you know you are you in single player, or to identify your play area in multiplayer. The Mii face gets happy when you win and sad when you lose. 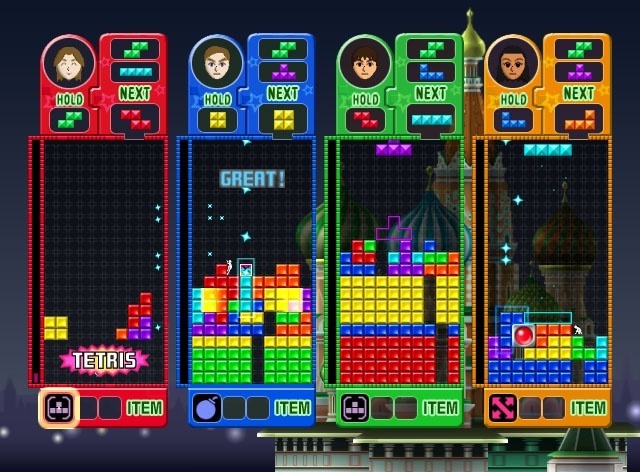 This is a step backwards from the original WiiWare version of Tetris Party, which had some modes with a fully animated Mii. Perhaps they felt this was too distracting, so they removed it. What's most aggravating though, is that no matter what your Mii is named, the game only takes the first eight letters, and you can't edit the name. For me, that means I get to play as "benstylu" instead of benstylus, and I can't even just shorten it to "ben" like I do in other games with a low character limit for names. Other than that... it's a reasonably good spin on Tetris, the puzzle game many of us have been playing off and on for the last thirty years. It's technically solid, and plays well, and on paper it's a fine Tetris to take home and introduce to the family. However, even though it works so well on paper, there just isn't love in this relationship, especially after experiencing what Tetris DS had to offer. You can still have a good time with Tetris Party Deluxe, but in the end you'll never be more than just friends.